Zacharia’s thoughts have been resounding in Malayalam literature with over a dozen short stories, essays, and stories. Zacharia has forayed into English literature with his debut novel, A Secret History Compassion. For a writer who has proved his mettle with tales that echoed a distinct craft and style, this novel speaks about partnerships. That may not sound novel but when we meet the characters, we get things straight. Lord Spider, is an established author of mysteries, thrillers, and romances. Rosie is his wife and J.L Pillai is an aspiring writer who is helping him in writing an essay for the Communist Party souvenir. Lord Spider might be a successful writer but has his times of self-doubt as a writer. He laments over his failure as a writer for penning only fiction when the world was brimming with non-fiction and facts of life were within an arms reach all around. He takes solace in his wife Rosie. She inspires him to confront the issue, and shift to writing non- fiction in the most organic way. Though he identifies himself as a vague communist, his popularity makes him take up the responsibility to pen the Essay for the Communist Party. It was for a souvenir to raise funds for destitute comrades. Compassion is the theme he chooses to jot down the essay. The rest of the novel runs on fiction as the theme with characters like God, Satan, Stalin, Gandhi doppelganger, Tarzan and Pretty Man enter the stage in this wordy world of shapeshifting and flying. 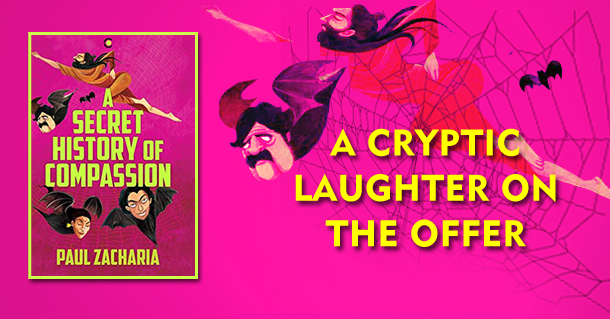 Zacharia offers us a peal of cryptic laughter in this fictional journey of his.